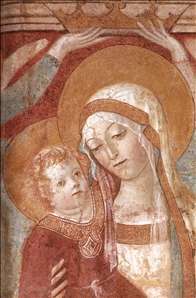 Francesco di Giorgio Martini, Sienese painter, sculptor, architect and engineer, belongs to a select group of Renaissance practitioners, including Brunelleschi, Alberti, Michelangelo, Peruzzi, and, of course, Leonardo da Vinci, who excelled in several of the arts at the same time. 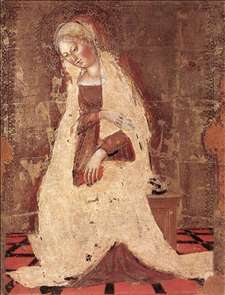 A native of Siena, he may have been trained by Vecchietta (1410-1480), both a successful painter and sculptor. Francesco di Giorgio s early career, however, is too poorly documented to make any definitive judgments. He appears in extant records for the first time in 1464, when he produced a wooden sculpture of St John the Baptist (Museo dell Opera del Duomo, Siena). In 1464 Francesco was charged with overseeing the intricate aqueduct system of Siena for a three-year period, and similar assignments as an engineer and architect continued to come for the remainder of his life, both in Siena and in other centres. His fellow Sienese painter Neroccio de Landi (1447-1500) became his partner, perhaps as early as 1469, until litigation abruptly dissolved the relationship in 1475. 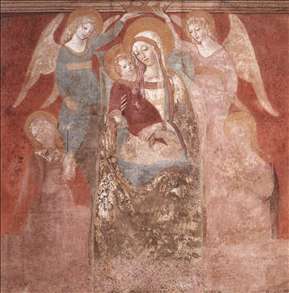 In the 1470s Francesco painted two different versions of the Coronation of the Virgin, one in fresco for the ancient Hospital of Santa Maria della Scala, done in 1471 (destroyed), and another, originally for the Benedictine abbey church outside Siena at Monte Oliveto, which appears to have been painted c. 1472. 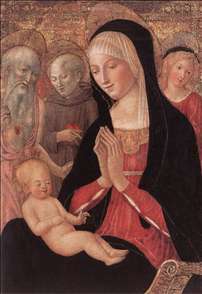 Francesco signed a Nativity that was commissioned in 1475. 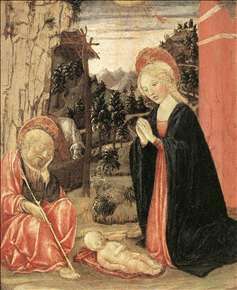 Another Nativity from the 1490s is also attributed to the artist. By the mid-1470s, Francesco di Giorgio s other skills were in strong demand, and in 1477 he was already in the service of the famed Federigo da Montefeltro of Urbino, primarily as a military engineer and architect. He built a great chain of fortifications for the Duke of Urbino, and he is credited with inventing the landmine. He also designed relief sculpture, intarsia decorations, medals, and war machines for his patron. 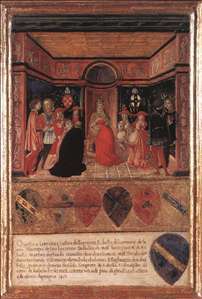 Francesco di Giorgio was in Naples in 1479 and in 1480. In 1484 he began his most famous building, the centrally designed Church of the Madonna del Calcinaio outside Cortona. 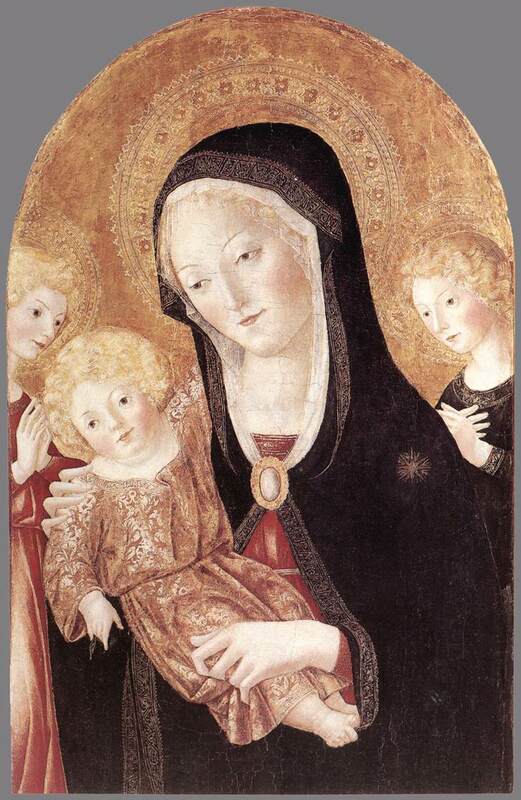 Returning to Siena from time to time during the same period, he continued to receive various official commissions, including the bronze angels for the high altar of the Sienese Cathedral (finished in 1498), but no paintings are recorded later in his career. Francesco, summoned to Milan to give advice on how to design the dome of the Cathedral, came into contact with Leonardo da Vinci, who later owned and annotated one of Francesco s manuscripts. The Sienese artist, along with important Florentines and a few other "foreigners," participated in a competition for designing a faade of the Cathedral of Florence. 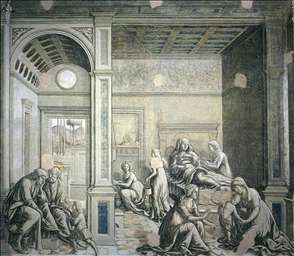 Back in Naples during the 1490s, he continued to be active in Urbino. In 1498 he finally returned to Siena for good when he was made capomaestro (head) of the works at the Cathedral. 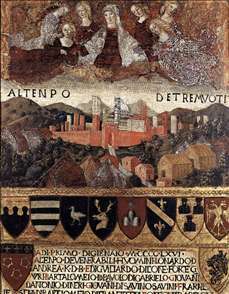 Francesco died in Siena toward the end of 1501, leaving behind, in addition to the works already mentioned, a series of manuscripts of the greatest importance devoted to architecture and engineering. 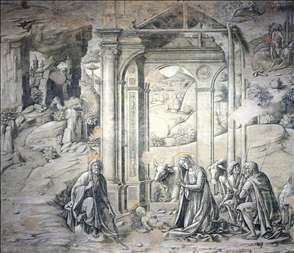 No documentation confirms that he continued to paint after the Nativity, although critics usually assume later activity, including the magnificent newly discovered essentially monochromatic frescoes in the Bichi Chapel of Sant Agostino in Siena which have been attributed to him. See more details about "Pope Pius II Names Cardinal His Nephew"
See more details about "Madonna del Terremoto"
See more details about "Madonna and Child with Angels"
See more details about "Madonna and Child with Angels "
See more details about "Madonna and Child with Saints and Angels"
See more details about "Madonna Annunciate"